I know you are feeling the heat and have been finding ways on how to beat it, hence this one's for you! Take the edge off a hot summer day with a healthy, easy-to-serve drink and enjoy it anytime, anywhere. Allow me to introduce yet again my favorite commercial apple juice, Mott's 100% Original apple Juice, now in cans. You can now pile up your fridge and shelves with these, which are now available at many stores and groceries in the country. Mott’s 100 % Apple Juice in can are sealed and filled with the same 100% apple fruit goodness and you can now bring with you when you travel. To welcome the newest member of the Mott’s family, the people behind it have put the fun back in picnic with an event last May 7 at the Bonifacio High Street, for a day of outdoor fun and play that kids, even mom and dad who attended have loved. The guests didn't mind the heat on the vast open space since it was surrounded by human statues, face painting, picture balloons, treasure hunts, hula-hoops, life sized tic-tac-toe, ladders & slides, ring and bucket toss game. More over, an abundant food sampling of corn munchies with apple sauce, apple-licious spaghetti, and caramelized biscuits were being spread around while sipping an out pour of Mott's 100% Apple Juice. After having to enjoy some of the games and the apple juice-infused dishes helped prepared by Nutritionist Cheshire Que, we witnessed the program launching of the new product from Fly Ace. “We at Fly Ace, are very happy to partner with a globally renowned brand like Mott’s, in bringing world class products closer to Filipino homes. Our exclusive partnership with Mott’s and the introduction of the handy Mott’s Apple juice in can will let more Filipino families enjoy delicious and healthy 100% apple goodness everyday at hme and even on-the-go occasions whether at school or at work,” said Fly Ace Corporation General Manager Ramon Daez. 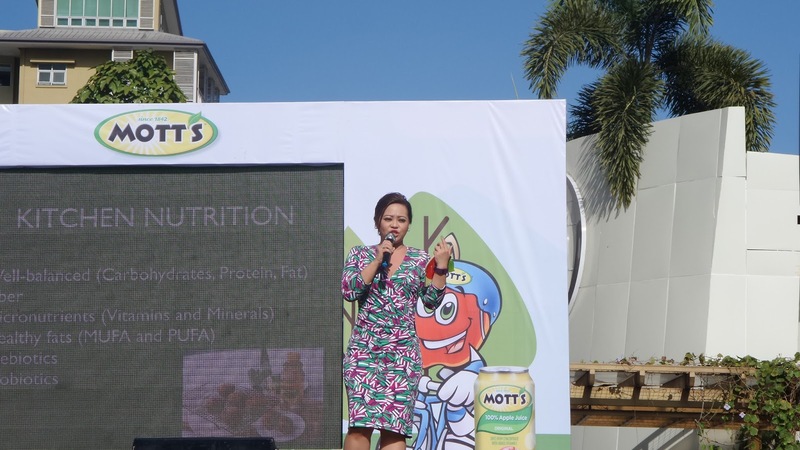 The event was graced by Mott’s Philippines official brand ambassador and mommymundo.com founder Janice Villanueva. As an inspiration to many mom-preneurs, she had always been on a mission to balance career and family, plus being able to serve meals that are full of health benefits, especially something the kids will love. Being a firm believer of the age-old adage “an apple a day, keeps the doctor away”, to Janice, Motts’ 100% Original Apple Juice is one of her kitchen staples. “After learning that Mott’s 100% Original Apple Juice only has three ingredients which are water, apple juice concentrate and Vitamin C, I knew that it’s kind of pure apple juice we’ve been looking for. It’s definitely a drink for all seasons and occasions.” she adds. Philippine-US registered Dietitian and Nutritionist, Cheshire Que, RND, RN, RDN, says that Mott’s 100% Original Apple Juice helps increase the nutritional value of the family’s daily menu. From hearty entree, savory snacks, to belly warming or cooling beverages, Cheshire’s easy to follow recipes are just all about delicious and nutritious ways that one can enhance food and beverages with Mott’s. This is truly being creative and versatile! Now, that officially an inevitable excuse to never run out of this beverage in your pantry. I was particularly interested on how these delish popcorn clusters were made. The apple flavor just give a nice and tangy pop to the caramelized popcorn. Even these chicken nuggets got marinated with America's favorite apple drink. I felt bad when I forgot to take a bite of these chocolatey goodness. These are Chocolate Cookies infused with Mott's. So, I took a moment yesterday and studied my pantry if I still have all the ingredients so I can whip up a couple of these for my family. With Motts’s 100% Original Apple Juice, you can always find fun and flavorful ways to hydrate and fuel your family. A trusted name since 1842, Mott’s supports moms in their journey to raise healthy an independent kids and want to provide everyday nutritious solutions to help her in that journey. Mott’s strongly believes that tomorrow starts with what you do today. Mott’s is perfect drink in hand after day of enjoying and being out in the sun, no doubt an ll yer round staple in a can that’s filled with nutrients. What’s even better is that your kids won’t even know they’re consuming real, whole, and purest apple fruit that’s neither bland nor boring. The event is in partnership with Jolly Al Dente, Lotus Biscoff, Great Leap Academy and Crayola. Beat the heat and feel the energy of summer, gather your family for a level up picnic bonding like never before with the newest Mott’s 100% Apple Juice in can. Fly Ace Corporation is one of the leading food and beverage consumer goods companies in the country today. Propelling limitless multiple-category growth by bringing the best of the world closer to Filipino homes, Fly Ace Corporation’s portfolio of food and beverage products includes house brands and exclusively distributed brands. Learn more at http://www.flyacecorp.com. Mott’s 100% Apple Juice is available in 64oz and 32oz family packaging in leading supermarkets, and groceries nationwide. The Mott’s in 11.05oz can is available in leading convenience stores and supermarkets initially in Metro and will roll out nationwide in the succeeding months. Media friends and co-bloggers were also there to participate in the event.